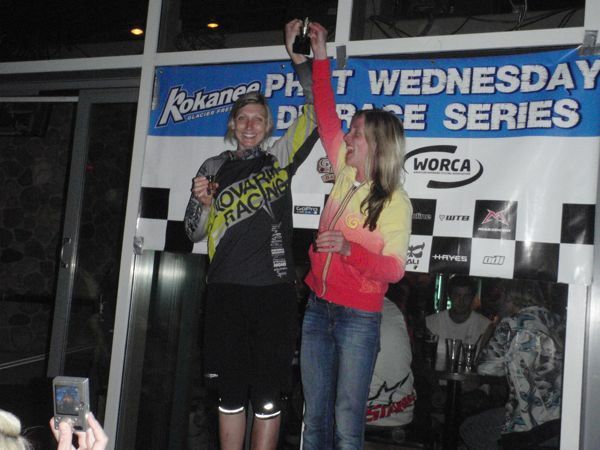 Another phast wednesday race has come around and today was no different not knowing the track till the morning of just to keep you guessing, its always a fun atmosphere as its a local race but its still really competitive as i guess there are some bragging rights at stake. The track was short but sweet and wild at speed tho, fast and flowy with big rock rollers, drops,steep rock faces,natural gaps, off camber sections and some slippery roots to finish it off. Claire and i were up the mtn early enough to get some desent practice in and we got our lines dialled in well, the track must have scared alot of people off as this time there was only around 45 entries compared to last weeks tamer track with over 200 entries. This was a real desent mtb race track they had marked out, you had to have your head screwed on you had to think, try different lines, stratergise, and commit as there were a few blind rollers and sections as you entered. 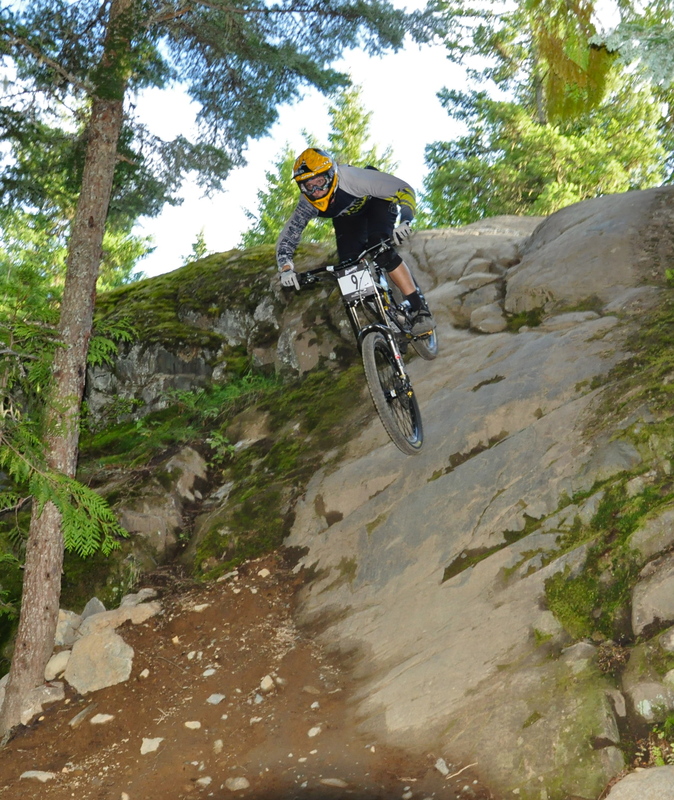 Claire on one of the fast entry rock rollers….Photo by Julie Istvan. Claire said she was a little sketchy on some off camber rock shelves and got a little wide, could have pedaled abit more but was happy with it and held it together to the finish. Claire took 1st with a time of 2:48, Katrina strand in 2nd 3:46 with a good crash, and these were the 2 only girls that entered. 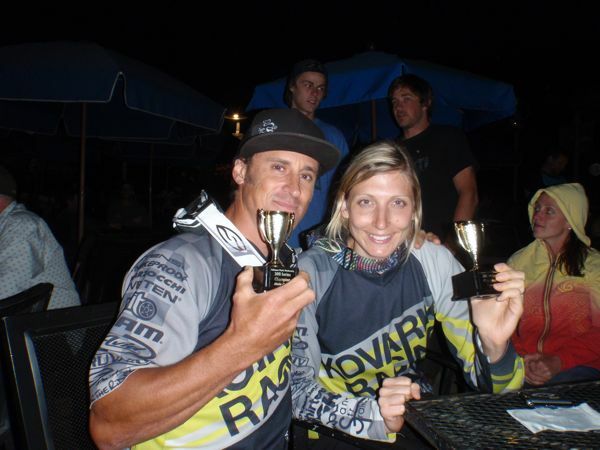 Same as claire , sorry limited pics at this local race….Photo by julie Istvan. I had a great run i nailed the top half of the track and pedaled where ever i could as the last half was more gravity fed, on the brakes, with little if no pedalling to the finish line so making up as much time before then was crucial. It was also great to see young local pinner tyler allison not far behind me in 2nd on his Intense M9, hes got some talent! Mens race podium, the young guns kept me on my toes today. 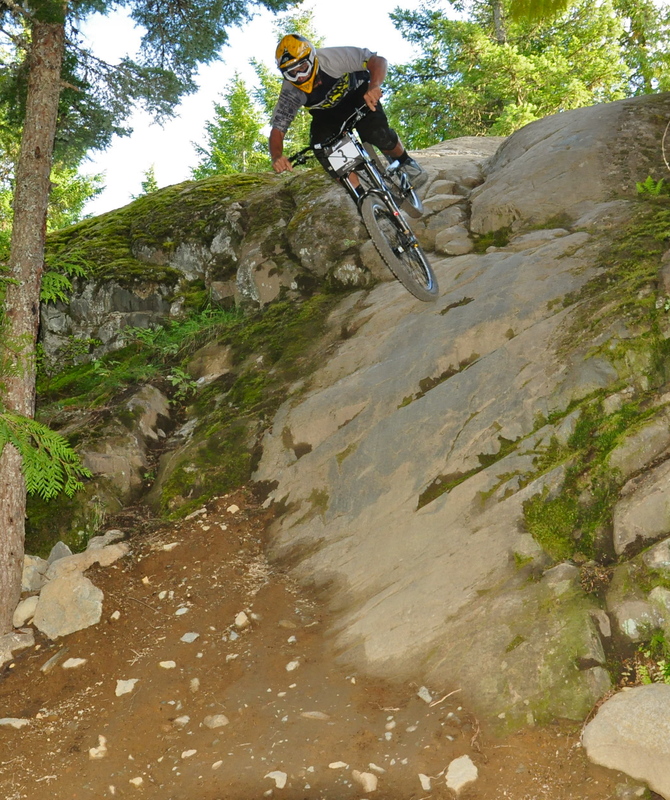 Then it was off to the GLC for the podium and a few beers to celerbrate. With claire taking the win on the day she tied for 2nd place overall in the series with her riding buddy katrina strand, katrina is a champ the few days before she was on a epic xc trip up north with days consisting of 9 hours in the saddle, so it was cool to see her manning up and representing the wild race today! Claire in first and tied with Strand for the overall. 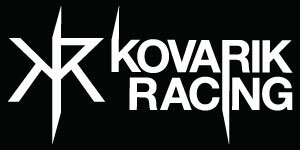 With myself taking the win today i also took the overall making it a great team effort by kovarik racing! 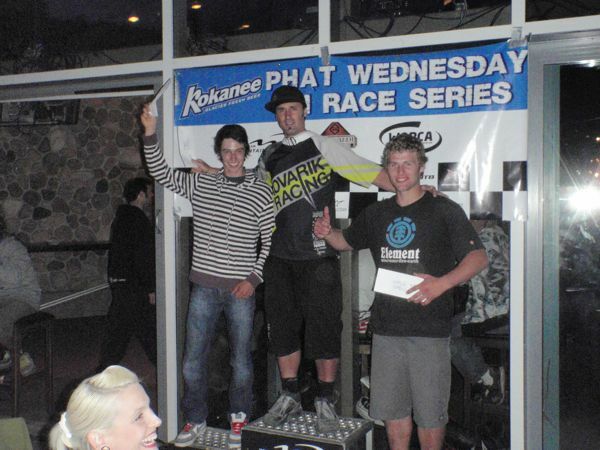 In 2nd was young gun tyler allison and another friend and fast local in 3rd Paul stevens. Being a top worldcup rider its great for me to race at these local races and be able to push the other riders, young riders and create another level of excitement to the event, there are always racers comparing thier time to yours to get an insight to thier level of performance which is cool! Claire is selected as top womens DH’er to represent cananda at the World Championships in Champery, Switzerland between 28th august to 4th september so we wish her best of luck when she leaves on saturday. I unfortunately missed out on Australian worlds selection for the first time since the year 2000 partly due to not receiving major parts at the time to have my bike built, so good luck to the aussies. Massive trophies for the overall wins yeew! Next week is a chainless race down the famous A-line jump track, its a fundraiser for young local racer boy nick geddes who unfortunately was diagnosed with lukemia a short time ago, we wish him well and will have an update for you guys then.